Home / chile / Arturo Vidal celebrating a reunion with Alexis Sanchez with a photo of both in Colo Colo: "Good to see you good brother"
Arturo Vidal celebrating a reunion with Alexis Sanchez with a photo of both in Colo Colo: "Good to see you good brother"
Arturo Vidal could not leave Alexis Sanchez without acknowledgment after both had lost the victory in Barcelona over Manchester United (3-0) on Tuesday in the quarterfinals of the Champions League. And the king used his Instagram account to congratulate one of his great teammates in the Chilean national team's golden generation. 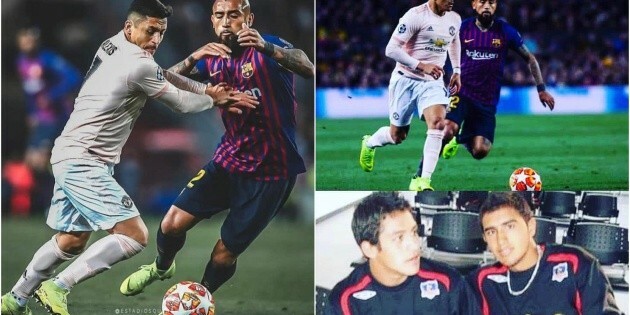 "15 years together, defending our country", began in a post with the image of both in disputes over the ball in the Nou Camp. The set of images also includes a reminder of the time of both in Colo Colo, when they coincided during the 2006 and 2007 campaign. "Over 10 years ahead of us, playing in the best teams in the world and always leaving the name Chile high! It's good to see you good brother," the king ended, who today expects the winner of Liverpool and Porto as a rival of semi-finals . In the duel between both went Vidal in minute 75, while Alexis saw action from the 80s.